Since xmas I am an owner of the 2014 Makergeek Mini Kossel Kit (http://www.makergeeks.com/mikofudiypae.html). The kit is great - it came almost complete with solid parts for the frame, extrusions, enough nuts and bolts as well as linear rails, and a glass print surface. Belts, RAMPS, Arduino Mega, Power Supply, etc. But the kit came incomplete, mine was missing a fan and a themistor. Living in the bay area pieces from Jameco where easier to order than trying to get the missing parts from Joshua at Makergeeks (Who was very helpful with advise during the assembly phase). The worst part however where the 3D printed parts for the printer. Especially the carriages that attach to the linear rails were rather badly produced. 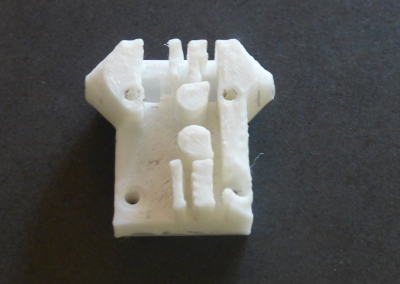 The parts were printed in a hurry, probably too hot and the infill was insufficient. This became clear during assembly. Due to the construction of the kossel the carriage is constantly under pressure. As you can see the piece holds the belt in place by looping it back on itself. Therefore making the additional zip-tie optional. The opening for 4 screws in the back M3×10mm (from mrmetric) provide additional stability to the carriage. 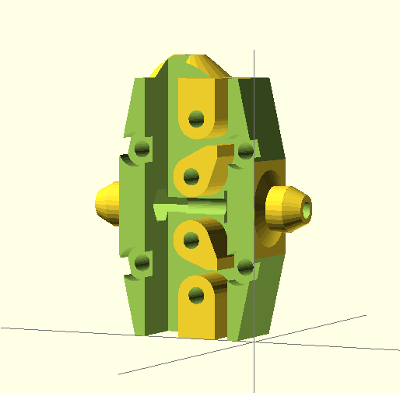 The CC0 openscad file is attached here - and available on thingiverse as STL and openscad file. I printed mine in 0.2mm layer height PLA on the kossel with support created with kisslicer, with 75% infill (I believe they would have been sufficiently stable at 50%). They have been used for over 2 months now. Please let me know about any further improvement ideas you might have. I am planning to create a new effector next, before looking at magnet or all ball/spring mount options. Technology to the rescue - Life is GREAT! We all have seen the amazing impact the iPad has had on the market - this is much talked about, and a great success for Apple. But what is the next big thing that will touch all of us? The fact that we discovered exo-planets, which exist in their solar systems Goldilocks zone and therefore might harbor actual alien life (and I am not talking about people from another country - but from really far away). The fact that the LHC is up an running again and will prove the existence of the god-particle to the world? Or will it be an economic “NEXT BIG THING” like the fact that companies like groupon (I somehow have the feeling that they are basically web pages) are worth billions of dollars? Anybody seeing a bubble there? I recently had my very personal “the future has arrived” moment. It is xmas, and everybody is running around like a headless chicken trying to find something they can give their beloved once, and their family. I hope to get to the point were I will be able to have a black-lit touch button build by combining an LED a touch sensor and some acrylic board or glass. 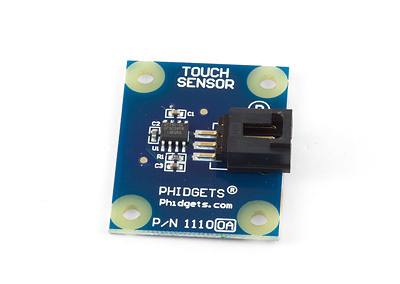 Since I have never done touch sensing before I decided to approach this vision with some experiments. This is the first experiment. Sebastian Steinhauer received his M.Sc. in Critical Software Engineering in 2007 from the University of Lancaster, England, after receiving his bachelor’s degree from Hasso Plattner Institute in Potsdam, Germany. This blog is powered by FlatPress. | 23 theme designed by zeuder.